Sir Neil Campbell, a British army officer who rose to become a colonial governor, was born 240 years ago today. He is largely remembered for a detailed and informative diary he kept while in charge of Napoleon Bonaparte during his exile on the island of Elba. That diary, first published in 1869, is the only extant diary left by Campbell, however a biographical memoir by his nephew, mentions another journal, and provides a single extract from it, about the capturing of a turtle at sea. Campbell was born on 1 May 1776. His father was described as a ‘Highland gentleman of ancient lineage, and fair landed estate’. After being nurtured in his ‘wild ancestral home’, he began his army career by joining the 6th West India Regiment in 1797. After three years service in West Indies, he returned to England and was promoted to lieutenant, and then to major. He returned to the West Indies, to Jamaica, in 1807, and then, after a sojourn in England for health reasons, journeyed again to the West Indies in 1808, this time being appointed Deputy-Adjutant-General to the Forces in the Windward and Leeward Islands. He was present at the captures, from the French, of Martinique and Guadeloupe. 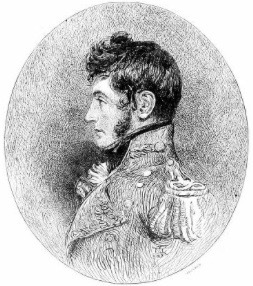 During the Peninsular War, Campbell was appointed colonel of the 16th Portuguese infantry, but in 1814, he was severely wounded at Fère-Champenoise in France. Later, the same year he was chosen to accompany Napoleon from Fontainebleau to Elba (where he had been exiled under the terms of the Treaty of Fontainebleau) with express orders from the British Foreign Secretary, Lord Castlereigh, that he was in no way to act as his jailer, but rather to allow the ex French emperor to take control of the island as a sovereign prince. Although, Campbell’s instructions also implied that he should not remain in Elba longer than necessary, he did promise to stay, at Napoleon’s request, until the termination of the congress of Vienna (which aimed to provide a long-term peace plan for Europe). It is thought that his presence on the island put the English naval captains off their guard, and thus enabled Napoleon to escape rather easily. Campbell went on to serve at the battle of Waterloo, and during the occupation of France, from 1815 to 1818, he commanded the Hanseatic Legion, consisting of 3,000 volunteers. In 1825, he was appointed major-general, applied for a staff appointment, and was given the governorship of Sierra Leone, reaching the colony in May 1826. The following year, however, he died of a fever. Further information is available online from Dictionary of National Biography, 1885-1900 or The Napoleon Series. Campbell is largely remembered today because of a diary he kept while in charge of the force escorting Napoleon to exile on Elba, and while remaining with him there - until his escape. The diary - published in 1869 by John Murray and freely available at Internet Archive - is titled: Napoleon at Fontainebleau and Elba being A Journal of Occurrences in 1814-1815 with Notes of Conversations by the late Major-General Sir Neil Campbell C. B. With a Memoir of the Life and Services of that Officer, By his Nephew Archibald Neil Campbell Maclachlan M. A.. The book, as the title implies, contains a biographical memoir about Campbell, rather formally written, as well as the journal kept by Campbell himself for a year from April 1814 to March 1815. The latter, in particular, is a valuable first hand account of Napoleon during his exile on Elba. According to Ravenhall Books, which brought out a modern edition of Campbell’s diary in 2004: ‘It records events as Napoleon builds an empire in miniature on Elba and it keeps an eye on the coming and going of agents and would-be assassins. Frank and enlightening it also reveals much about the personality of Napoleon and of the tensions and subterfuge within the exiled community as Napoleon devises and implements his plans for an escape.’ Here are several extracts from the original 1869 publication. ‘From daylight to breakfast at 10 P.M. Napoleon was on foot, inspecting the castles, storehouses, and magazines. ‘At 7 A.M. he crossed the harbour in Captain Usher’s boat, proceeded on horseback across the island to Rio, and examined the mines, then ascended a number of hills and mountain-tops upon which there are ruins. After a ‘Te Deum’ in a chapel, we had breakfast. On our return we re-embarked in Captain Usher’s boat, but, instead of returning direct. Napoleon visited the watering place, the height opposite the citadel on which he proposes to establish a sea-battery, and a rock at the mouth of the harbour on which he also thinks of placing a tower. In talking at dinner of his intention to take possession of a small island without inhabitants, which is about ten miles off the coast of Elba, Napoleon said, ‘Toute l’Europe dira que j’ai fait une conquête déjà.” He laughed at this. ‘From 5 to 10 A.M. Napoleon visited other parts of the town and fortifications on foot, then embarked in boats, and visited the different storehouses round the harbour. In making the excursions into the country, yesterday and the day before, he was accompanied by a dozen officers. A captain of gendarmes and one of his Fourriers de Palais always rode in front; and, on two occasions, a sergeant’s party of gendarmes-à-pied went on about an English mile before. ‘Before landing from the frigate, Napoleon requested that a party of fifty marines might accompany him to remain on shore. This intention was afterwards changed; and one officer of marines and two sergeants, to act as orderlies, together with a lieutenant of the navy, were sent. ‘Napoleon told me that he had taken Malta by a coup de main; that the inhabitants were so intimidated ‘par le nom de ces républicains, mangeurs d’hommes,’ that they all took refuge within the fortifications, with cattle and every living animal in the island. This created so much confusion and dismay, that they were incapable of opposition. ‘This morning, at 6 A.M., Napoleon went quite unexpectedly on board of the French frigate ‘Dryade,’ and the crew hailed him with cries of ‘Vive l’Empereur!’ This, I am told, placed the captain in a very awkward situation. It was not a visit to the captain personally, for he had anchored on the preceding afternoon, and then Napoleon declined seeing him, when he waited upon him, until the following morning at 10 a.m. So that it was certainly done to try the disposition of the Navy, and to keep up a recollection of him in France. Napoleon also visited the British frigate ‘Undaunted,’ and made a speech to the crew. He thanked them for the good-will with which they had performed their duties during the voyage, said that he felt himself under obligations to them for the period he had been on board, which he had passed so happily, and that he wished them every success and happiness. He sent them, in the course of the day, 1,000 bottles of wine and 1,000 dollars, and presented Captain Usher with a box containing his portrait set in diamonds. Napoleon speaks most gratefully to everyone of the facilities which have been granted to him by the British Government; and to myself personally he constantly expresses the sense he entertains of the superior qualities which the British nation possesses over every other. Five British transports arrived here this morning from Savona, with about 750 volunteers of Napoleon’s Guards, his horses, and baggage. To-day I informed General Bertrand that, in case either Napoleon himself or others might ascribe any underhand motive to my remaining here, I was ready to quit the island at once, should such be his wish; that I had only remained after the other Commissioners in order to procure for him those facilities which he had requested, through me, from the British Admiral. ‘Wrote Lord Burgbersh with news from Draguignan of the 13th inst., and mentioned a report of Napoleon having entered Lyons. ‘10 A.M. Lisère; passed the Moselle in a flat. It is worth noting that in the biographical memoir section of the book, there is mention of another journal kept by Campbell during his journey to the Windward and Leeward Islands in 1808. Here is what the memoir says about that journal, including an extract from it (although I can find no further information about this journal anywhere else). ‘A Journal kept by him during the voyage, and illustrated by plans and drawings, relates the usual incidents on board a troopship of that period, sailing from Woolwich to Barbadoes, and passing by Porto Santo, Madeira, and Teneriffe. The ‘Creole’ mounted twelve six-pounders and two nine-pounders; had a crew of twenty-four men, including master and mate; and carried, besides Lieutenant-Colonel Campbell and his servant, a detachment of Artillery, consisting of five officers and forty-six men. At the Downs she joined company with 150 sail, many of them transports destined for Spain; but soon after, weighing anchor from thence, the convoy was caught by a tremendous gale, which effectually dispersed it, and blew over several of the vessels - the ‘Creole’ among them - to the French coast near Boulogne, though with no ultimate loss. On November 2nd, off Lymington, a detachment of Foreign Artillery, consisting of one sergeant and twenty-sis men, was taken in.